You’re just too nice. Seriously. | Be Nice. 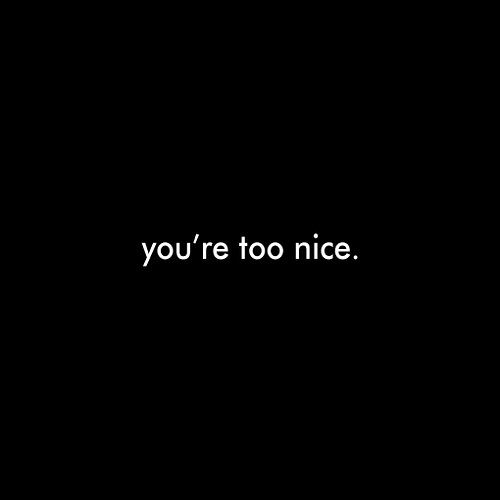 You’re just too nice. Seriously. You know the type: people-pleasing tendencies, lacks self-confidence or an autonomous behavioral compass, and – the obvious one – a doormat. An “emotional tampon” (gross analogy – my apologies, but true don’t you think?). Last week a friend of mine described his frustration with his neighbor. “Tom” can’t really stand “Sheila.” Sheila is a daddy’s girl with all the entitlements that go along with it. Seriously spoiled, Sheila has no idea how lucky she is, or how nice she has it. Worst of all, she doesn’t make any effort to develop herself financially even with her dad’s support. And this rubs Tom the wrong way – he made his own way in life, and it irks him that someone can be so lucky and so completely ungrateful and complacent. For some reason whenever Sheila needs something done around the house, she asks Tom for help. Now, I know what you’re thinking: this isn’t a “crush” thing. I think it is more of a “substitute daddy-figure when the real dad isn’t around” type of thing. It started innocently enough. When her car was having problems, Tom tinkered with it trying to figure what was wrong. When it had to go to the shop, he’d allow her to come on grocery trips with him instead of making her walk the few blocks to a nearby store. Sheila doesn’t ask for help anymore. She tells Tom what to do. “Hey, you’re going to need to come over Saturday and fix my sink.” (Reminder: Tom is not a relative, boyfriend, or landlord. Just a neighbor. They don’t hang out as friends.) What did Tom do? Well, he was miffed for sure. And he had plans to hang with one of his buddies on Saturday. He canceled them. When he told Sheila that, she didn’t seem embarrassed or upset he had canceled his plans for her either, and she certainly didn’t make an apology for inconveniencing him or offer an alternative time/date. What’s more, she doesn’t ever thank him. She complains about how tough her life is, how uncool her dad is (the dad that is her virtual lifestyle paycheck). When Tom’s buddies try to suggest maybe she should make it up to Tom (with baking, or money perhaps), she becomes indignant. At that point her gratitude is a fast retort to flatter her own bruised ego and to save face with Tom’s friends. And this never ends. Even though it makes Tom angry, he feels trapped. After all, he is her neighbor, her dad is absent and can’t help all of the time, and he does know a lot of handyman skills. In my estimation, Tom is too nice to Sheila. But perhaps not for the reason some might suspect. Doing nice things for neighbors is what being “neighborly” is all about. My neighbor is elderly, so we do the yard work, snow removal and occasionally grab things for her from the store in inclement weather. It is the “nice” thing to do. And doing nice things without expectation of repayment is a good habit to be in, assuming you are not doing it all the time to your own detriment. The problem with Tom and Sheila is the lack of gratitude and appreciation on Sheila’s part, which is further complicated by Tom’s inability to meaningfully confront Sheila. Though he suggests a return on his time investment (perhaps bake him some cookies, or give him gas money when he drives her around), he does not cut off his assistance when she doesn’t follow through on reimbursement. Her promises are empty, and his confrontations are on an equally weak foundation. Tom is becoming more and more irritated with Sheila. As his friend, I offer my sympathies but I also feel like Tom is making his own bed. I believe many of his frustrations lie with his inability to be assertive to Sheila, where before they were attributed solely to her actions. The lesson here is not necessarily to keep tabs, but to be aware. If you find yourself giving (of your time, attention, funds, or efforts) over and over to the same person without any meaningful return to your investment, perhaps it is time to question your generosity. If the act of giving brings you joy (as doing things for my elderly neighbor does me — plus it’s good karma for when I’m older! ), that could be enough. But if you feel your resentment growing, address the problem and be prepared to follow through on the removal of your generosity if the person continues to abuse it. Otherwise you may end up resenting yourself too. This entry was posted in At Work, Be Nice. Challenges, How to Argue, Perspectives on Be Nice., With Others and tagged alloveralbany.com, can someone be too nice?, doormats, generosity, Liz Clancy Lerner, pushovers by Jen. Bookmark the permalink. This is well-said, and I agree!